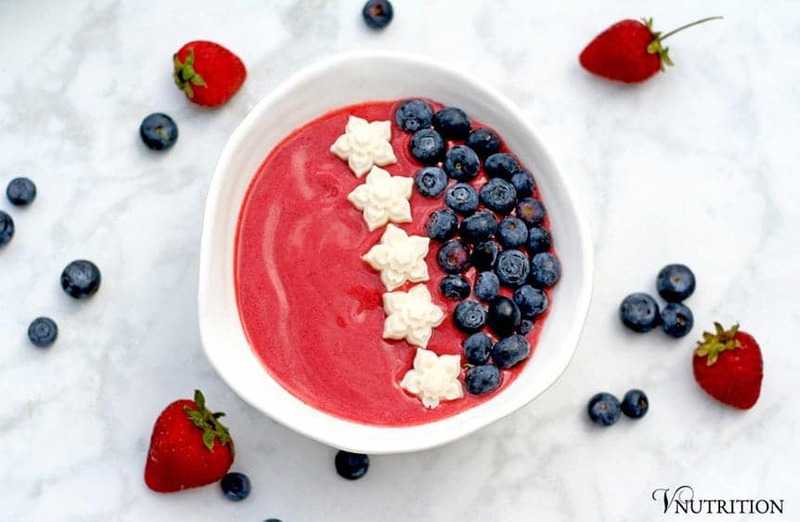 This Patriotic Smoothie Bowl celebrates the USA with strawberries, blueberries, and coconut butter stars. 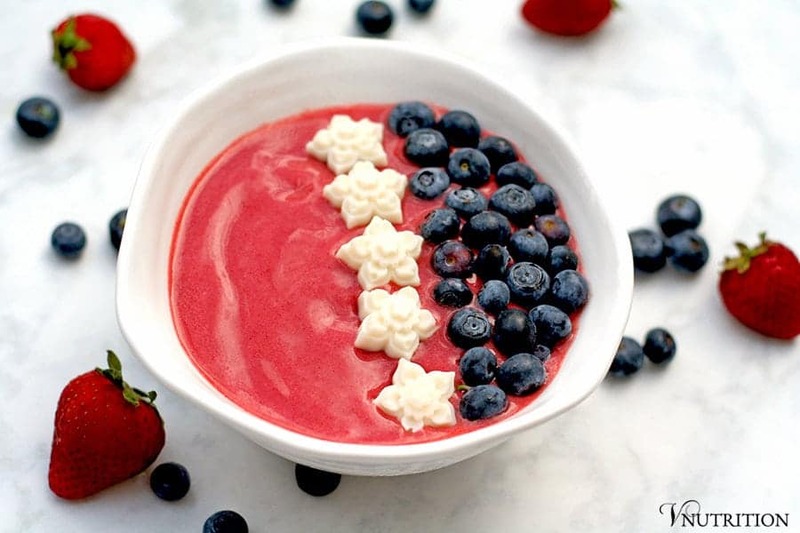 Make one for breakfast or as a snack anytime your want to show your red, white, & blue pride! If you’d ask my family, they will tell you that I’m obsessed with holidays and maybe even go a bit overboard for them (I have red, white, and blue starred khakis ready for anything celebrating the USA). 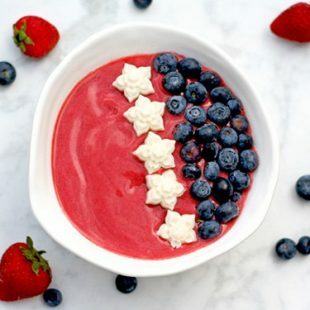 I’ve had requests for more smoothie bowl recipes after my How to Make a Fabulous Smoothie Bowl post so I thought, what’s a better way to cool off and celebrate our country than a chilled bowl of tastiness? 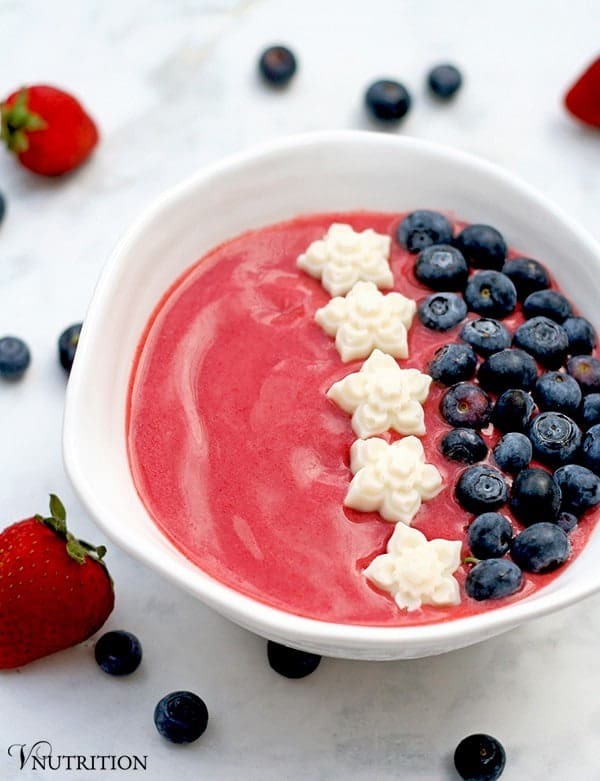 Enter my red, white, and blue Patriotic Smoothie Bowl! This bowl is a little different than my normal smoothie bowls. To be honest, it’s almost more like a dessert because I don’t use my typical protein powder or greens. Although I wholeheartedly love me some greens in my smoothies, I thought it would mess with the “red” color I was going for. For toppings, I added blueberries for the blue, which was an obvious choice but I had a bit more trouble with the white. At first I was going to do bananas cut into little stars. I did try that and the results were really cute (and tasty) but they didn’t come out as well as I would have liked for the pictures. Instead of fruit, I decided to use a candy mold of little stars and wanted to fill it with something like white chocolate. Of course, I had no white chocolate and I wasn’t running back to the store again so I found coconut butter and thought that would work really well. So glad it did! Plus most coconut butter is just coconuts formed into a creamy consistency so it’s healthier than white chocolate – not that I’m judging, go for the white chocolate if you have it, it’s a holiday! Don’t have candy molds, white chocolate, or coconut butter? Feel free to use a small cookie cutter and cut star shapes in bananas or apples if it’s easier than using a mold. The kiddos can help with cutting the shapes! This recipe will make one very large bowl or 2 smaller smoothie bowls. If you’re doing these as a kid’s dessert, you could probably get 4 mini bowls from the recipe. If making coconut butter stars: Melt coconut butter or white chocolate and pour into mini star molds. Let harden in the freezer for about an hour. Add all smoothie ingredients and blend. If the the consistency is too thin, add a few ice cubes. Pop out the stars and top the smoothie bowl with them along with blueberries. If you don't have a star mold, use bananas or the inside of apples and cut star shapes with little cookie cutter and top the smoothie bowl with them along with blueberries. Mary Ellen, I love this! Even more festive than red, white and blue khakis. 😉 I’ll sub a ripe pear for the banana, since bananas don’t love me as much I as love them. Either way, looks refreshing and tasty! Great idea on the pears! I was thinking apples would work but I always forget about pears! So pretty and colorful! I love a good smoothie bowl. Thank you so much Courtney! 🙂 Smoothie bowls are my favorite! This looks so perfect and festive, thanks! 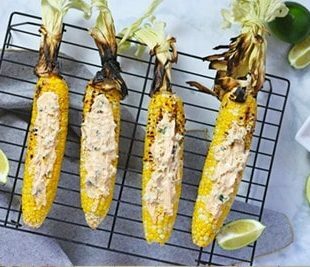 Thanks for sharing this at Healthy Vegan Fridays. I’m pinning & sharing! I don’t know how I missed this recipe last year. I’m so glad you included it your newsletter today!